WASHINGTON (WMAL) – People come to the National Mall from around the world to visit memorials honoring veterans from the Korean War, Vietnam War and World War II, but when it comes to World War I, there’s only a small memorial honoring hundreds of District residents who served. Plans are in the works to build a National World War I Memorial at Pershing Park to remember all of the nearly 5 million men and women who served in that war. “We feel as though no veteran should be forgotten, and no war should be forgotten,” said Chris Isleib, a spokesperson for the US World War I Centennial Commission. Thursday kicks off five days of events commemorating the centennial of the U.S. involvement in the Great War. People will have a chance to learn about the National World War I Memorial at the First Look Pavilion in Pershing Park where there will be a model and information about construction. 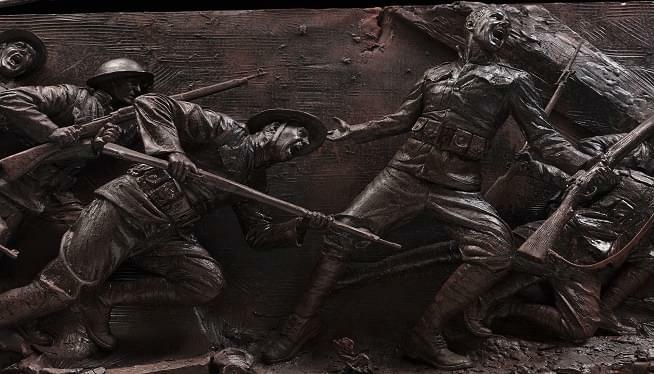 The memorial – designed by sculptor Sabin Howard – will include a 60 foot wall called A Soldier’s Story with figures depicting the evolution of a soldier. “Of preparing to go to war, leaving the family, going to war, being a changed person from the war and then returning home a different person to the family,” said Isleib. So far, Isleib said, the commission has raised about $20 million of the $37 million in private donations needed to build the memorial. A ceremonial groundbreaking was done in 2017, and Isleib said they hope to do a shovel ceremony on Memorial Day of 2019 and dedicate the memorial on Nov. 11 2021. For a full list of events for A First Look, click here.